Custom Art Stamps are now available for purchase at Heights Arts! 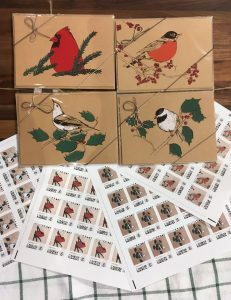 Everyone loves sending handmade, local cards for the holidays. Now you can add another layer of local art with postage featuring designs from local artists as well! Denise Stewart’s love of birding shows on her hand printed cards and tea towels. The same lovely images are now on custom postage stamps! Stop in today to purchase any one of four designs, or collect them all! First Class mailing stamps come 20 per page. At $25 per page ($20 for Heights Arts Members) this is a great way to send local art this season!